The very best quality potatoes, sourced for their superior taste and distinctive crunch, are cut into crinkled slices and cooked right here in Dubai. The ridges and valleys definitely give you more crunch and hold more intense flavours! This Sweet Chilli Chutney flavour could be truly one of Hunter Foods’ signature flavours and passionately loved by so many of our chips’ fans! 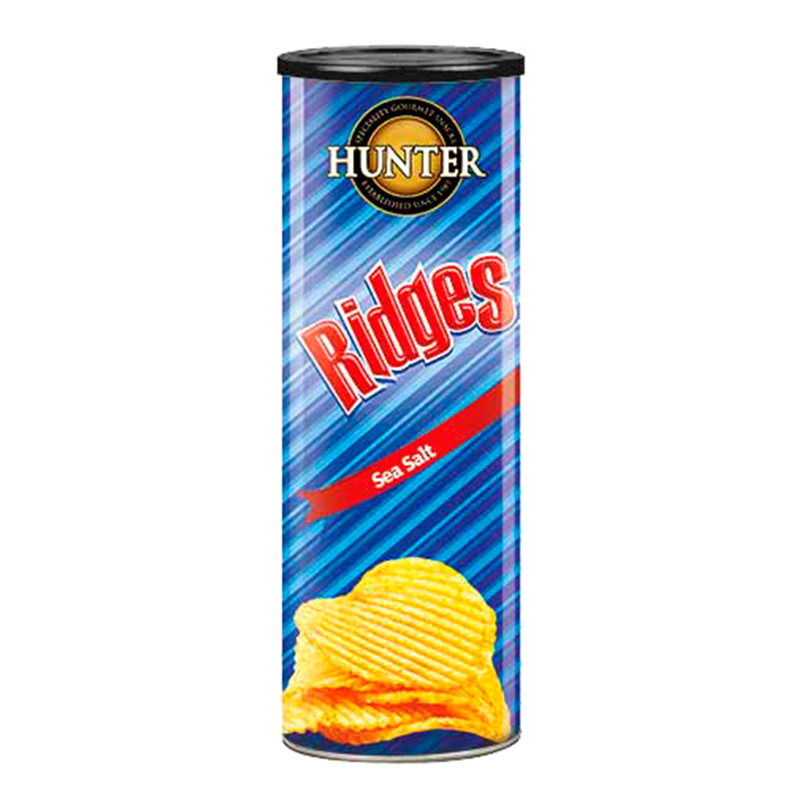 The rippled chips are delicately flavoured, with the fruity sweet tangy mango taste first, then very rounded savoury mildly spiced chilli curry to follow. It is an explosion of flavours, bite after bite. They are vegan and MSG free and no artificial preservatives or colours. Right afterwards, they are packed in our world-class, foil-lined canisters straight away. We definitely do our best to ensure that they reach you in all of their just-cooked, delicious glory. How about having them at your parties or movie nights? Hunter Ridges – Sweet Chilli Chutney (75gm) 75gm Canisters. Potato Chips, Non GMO, No Preservatives, No Artificial Colours, Vegan, No Transfat, No Cholesterol, Halal. Potatoes, sustainable palm fruit oil, sweet chilli chutney flavour: [sugar, rusk (wheat, flour, salt, acidity regulator (E262(ii), flavor enhancer (E621), coriander, acidity regulator (E330), turmeric (natural colour), mustard bran, malt flour, rapeseed oil (non-hydrogenated), tomato powder, anti- caking agent (E551), paprika, mango flavor, fenugreek, natural tomato flavor, natural curry flavor, blended capsicum oil (capsicum oil, sunflower oil - non hydrogenated), rice flour blended ginger oil (ginger oil, sunflower oil- non hydrogenated), dextrose wheat flour, ground spices & dried herbs (cumin, paprika, oregano, black pepper, fennel, turmeric), vegetable powder (onion powder, garlic powder)].